A thin stream of rainwater followed the delicate arabesque of the Moorish fretwork before falling to the tiled floor where it bounced before being lost in the general deluge. Damp groups of soggy cold tourists huddled together for warmth and to admire the Alhambra through driving rain. We made brave dashes from archway to archway across the elegant courtyards of the Nazrid Palaces; past the rain-pockmarked pools that should have been glassy mirrors in bright sunshine. We shivered as we admired the rich blues and reds of encaustic tiles and froze as we marvelled at intricately carved ceilings. The palace was carefully designed to create cool in the blistering heat of a Granadian summer so in this weather it was effectively a walk in freezer. If the bus ride up was a rampant dash then the ride back down was a feat of daring only for the brave. The extremely wee bus scooted down hills so steep the floor inside the bus sloped at a forty-five degree angle, but we were packed in close enough to keep ourselves upright. Standing at the front I could see white walls approaching at speed whenever the slippery road took a sharp turn and more than once I wondered idly if I was about to make the evening news for all the wrong reasons. I had arrived to perfect sunshine and heat, and having left Ireland at 5am was still wearing a thermal vest and had done the dance of the seven veils to remove it while waiting for the airport bus. I soon found myself sitting with my travel mate under the arbour of a small taverna beside a baroque church for my first experience of tapas. I was hooked. We set about truing as many as possible, tapas being a speciality of Granada. However, that was the last we saw of the sun. The Bodega Carteneda is considered the oldest tapas bar in Granada and is famous for its wide menu selection and glorious atmosphere. Waiters yelled continuously, the bar was mobbed, the small space packed with happy Granadians while huge platters of rationes were ferried high over the heads of the crowd. A warm fug of happy people permeated the room and we soon got a spot at the counter opposite the galley kitchen where we could see what was going on. On the first night we ordered the hot tapas half ratione and a wooden platter arrived with enough food for a small horse. 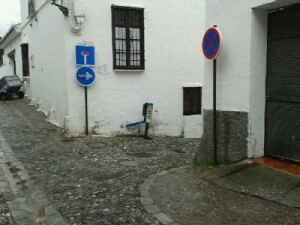 We braved the rain to walk among the narrow alleys and streets of The Albaicín section of Granada. The guidebooks would have you believe that this was the dodgy part of town, warned ominously about thieves and bandits, we saw none. White painted walls and black wrought iron bars of nestled tall houses clustered up the hill, often we turned a corner to see the walls of the Alhambra laid across the crest of the hill opposite, an Arabian nights palace in dusky pink stone. We walked down steep hilly cobbled streets looking into tiny courtyards of exuberantly colourful mosaic patios, and passed a guitar maker in his workshop. A medieval Moorish bathhouse was quiet and still in the centre of the tourist zone. 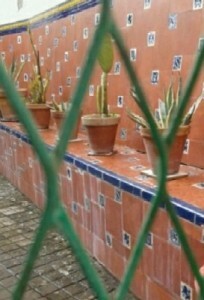 A place to sit and contemplate, avoid heat, have a chat, tiled water cisterns for a quick splash. It may have been the ambience but it still had the echoes of past times. The sky trickled grey rain. The bar with the recommended Flamenco show was booked solid, but the sun was over the yardarm somewhere, so we tried the local sherry. Solana – rich amber liquid, thicker and sweeter than most Sherries. And the tapas they brought with it was midas. This wonderful dish is made of fine breadcrumbs fried in bacon fat with roasted garlic, garnished with bits of bacon and fried green peppers. In the evening we made our way to the Sacromonte area to find anything flamenco, we knew it was likely to be at the touristy end of the spectrum, but we were in the mood, and guidebooks promised us gypsies in caves. It turned out to be a pretty hillside street lined with taverns built into what looked like old cellars. The floorshows were what you would expect, perfectly pleasant but soulless, no duende here. The next morning the rain came down in sheets, rivulets running between our feet as we peered from under an umbrella into shop windows full of excoriating tat – bliss! Surely it is only on holiday that these shops hold such an allure. Shelves were packed with tiny colourful things of a generally Spanish theme, flamenco hair combs, an array of folded fans, dodgy painted pottery and tiles and for reasons unknown a vast collection of dolls house furniture. Just stuff. My companion bravely tolerated my shopping compulsion for longer than I had any right to expect and then he consulted his notes to see which tapas bar we hadn’t yet frequented. The tiny Reca bar is rightly famous for its Salmorejo. This is a cold tomato soup of sorts but that description doesn’t do it justice. It was sweet with tomato ripened under a Spanish sun but gently sharp with a hint of vinegar. That evening we decided the time had come for the mother and father of all tapas crawls. This was going to present some logistical problems. If we were purist, and ate only whatever the bars decided to give us free with each drink then we were likely to become seriously pickled early on and not last long enough to try out very many tapas. If on the other hand we ordered them ourselves we removed the random element. So we compromised, let nature take its course for the first drink in each bar, then get more strategic. The other logistical problem that emerged early on was that we were seriously lacking in capacity to consume the incredibly generous portions being served. However, we were on a mission so soldiered on as best we could trying out as wide a variety as possible. The décor of Los Manueles was grotty Formica but there was a lively crowd. The free tapas arrived, an unappealing stew, then we spotted deep fried anchovies on the menu and promptly forgot our plan. Nearby in the Bodega Castañed the winner was a plate of lettuce, artichoke hearts and salted anchovies dressed only in sweet olive oil with a dusting of dry dill, and was more than the sum of its parts. We carried on. Cervecceria La Plaza had a leg of Jamon Serrano on a stand, we watched as a new one was opened and the careful carving began. It was served on a wooden platter with olives and salted almonds. We were defeated. It rained solidly for three days without let up. We trudged around in it damp and cold. But truth be told although I know this to be true it’s not what I remember. Granada is a warm place in any weather, the orange stone, churros and hot chocolate for breakfast and crowded bars with their profligate tapas endlessly inviting. That said, just to be sure, next time I will go in June.